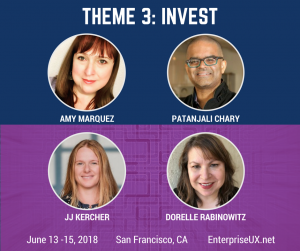 Our INVEST theme, one of Enterprise UX’s four “mini-conferences,” focuses on strategic gains over quick wins, and balances long- and short-term priorities. INVEST helps us think beyond our immediate needs and lay the groundwork that supports the growth of design and design practitioners within an enterprise: Understanding context across functional teams to create strong partnerships, building and supporting effective teams, and making sure that our teams are developing the skills that will make them successful in the future. What does it meant to invest in design if you’re an enterprise? These four experts will show you how investing in your people, education, and resources can transform your products and your entire team’s productivity. Get a taste of what we’ll cover in this short podcast interview with Amy Marquez—or just go ahead and register for Enterprise UX.